I think I could well be described as a little offset from the norm – it’s a good way to be, I maintain. A fruit-loop through and through. But I like to think some sensible thoughts make their way into my head on occasion and am pleased to offer up an example of this sensible headedness here. My favourite green & blue projects are ones where I can see a way to make a difference, a tangible difference to the problem without too much finance or effort. Not because I am lazy or tight, but because small tangible efforts and contributions can sum to a hefty whole and more people will want to be a part of it if they see that it’s feasible. I have always been a bit sceptical of some of the heal-all-evils claims made my some carbon offsetting promoters but I like the idea in principle. Mitigating the effects of carbon dioxide emissions which result from your fossil fuel burning, namely through travel and industry. My industry being rowing, means that I will be reasonably low impact while at sea in terms of fossil fuel burning (no space for coal on board!) – I am the engine and my electrical power is derived form solar energy. However, my beloved ‘Dippers is on her way to Australia via one or more lorries and one or more container ships and I fly Down Under next week. I am not one to say we should never ever travel again and should all stay at home – we have to be realistic. But the idea that I can contribute some money to sponsor sustainable projects which work to make tangible improvements to low income families struggling to find firewood was appealing. 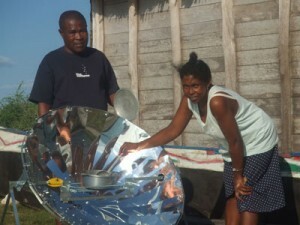 So for a small chunk of dollar (less than £100 for all inbound/outbound travel for ‘Dippers and me) I have offset my travelling with Blue Ventures Carbon Offsetting – funding fuel efficient stoves and solar stoves in Madagascar. This allows local people to spend more time doing other things rather than collecting firewood, gives woodland a chance to recover from over-harvesting and brings communities together in their bid to get everyone involved. In turn more trees being allowed to grow means that more carbon dioxide is absorbed from the atmosphere, which can only be a good thing. So I am not saying that this is the way to solve global warming, but it is a good way to help those who could do with a hand in the right direction, bringing them immediate social, economic and environmental returns. It’s all about small steps in the right direction – exactly the same way I’m going to make it across the Ocean. More information on the projects can be found through their website. BTW the link you give for BVCO is incorrect (that URL is parked). Good job for being green. I believe that we all should practice what I like to call “Responsible Environmentalism”. That being buy reusable items, recycle, shop local, and help others to do the same. I too am skeptical about the evils of carbon and the carbon offsetting programs but in theory it is a good idea. I absolutely love the solar cookers and have used a home-made one in the past. They work absolutely brilliantly in the warmer sunny climates. Use what we have here responsibly and try to put a little back whenever possible. Anyway, I could go on for hours on the topic but I won’t. Shipping by sea is one of the most cost(money and environment) efficient way of moving goods around the world.